Barefoot skiing world champ, Georgia Groen. PHOTO: supplied. First-year engineering student Georgia Groen scooped five medals at the Barefoot Waterski World Championships, and defended her title as the world’s best women’s trick skier. The 17-year-old broke New Zealand records in the tricks and slalom categories at last month’s champs in Mulwala, Australia, and took silver overall in the open women’s section where she competed alongside older skiers. Competing at the world champs meant missing the first three weeks of her first-year engineering studies at the University of Canterbury and she is furiously catching up now. Groen travels to America once a year to train at the World Barefoot Center in Florida, where her cousin Ben Groen is an instructor. In fact, four of the Groen clan competed in the New Zealand team, including Georgia’s older brother, cousin and uncle. 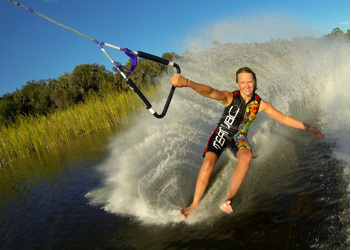 The family’s talent for the sport means the Groens often make up most of the New Zealand barefoot water skiing team. John Weller from the New Zealand Waterski Association said that not only did Georgia perform exceptionally, but also the entire New Zealand team did a fantastic job. “They were probably one of the most successful New Zealand barefoot teams we have had to date,” he said. Groen’s next goal is to be best overall woman at the world championships. She will head home before Easter to train on Lake Inspiration, Otaki, and spend the university holidays competing at the national barefoot competition at Lake Karāpiro, and then at the Australian national championships in Perth. Georgia’s parents fund most of her travel costs, as the sport has little funding, apart from a small amount from the New Zealand Water Skiing Association.